Despite some negative news over the past year (since Spring Break 2015), Panama City Beach is still expected to be king of the crop when it comes to Spring Break destinations for 2016. Yes, things get rowdy at times, and yes, there can be a backlash from certain people. 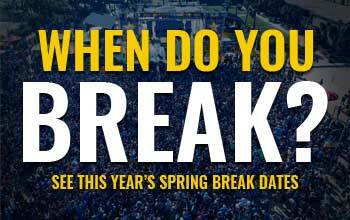 But… it’s Spring Break, and people tend to go where the party is the biggest and the best. And that place is still Panama City Beach. With 27 miles of sandy beaches along the Gulf of Mexico, it’s no wonder this place is a magnet for sun worshipers. The Florida Panhandle destination is still expected to lure more than 250,000 students this year, which will continue to make it the highest populated destination for more than 20 years now. Hotels are still booking rooms, so if you haven’t booked yet, now is the time! Check out the clubs you’ll get to visit here, and don’t forget your VIP Party Passes and to attend the Beach Bash Music Fest.